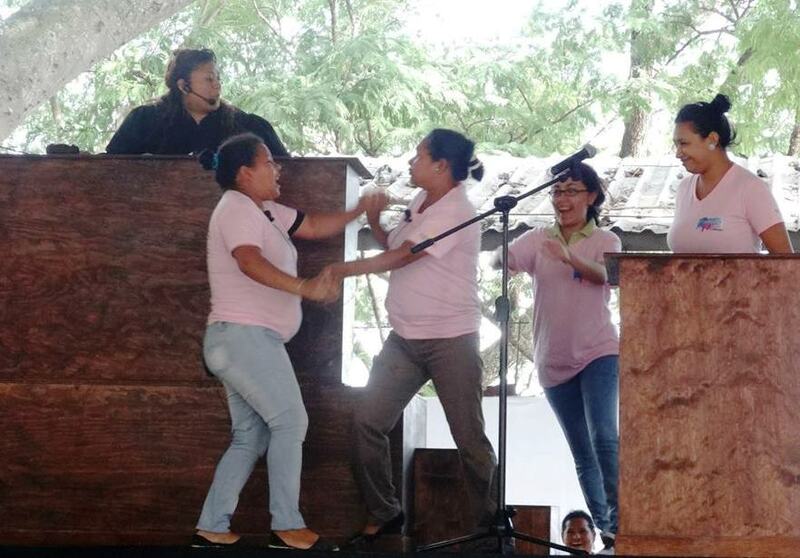 Following a series of trainings on violence and sexual and reproductive health, fifteen Honduran women represented seven short plays focusing on violence prevention and sexual and reproductive health for an audience of over 500 people. These activities were developed in mid and late 2014 with the support of GOJoven Honduras and the Sombra Roja Theater. The GOJoven Hondu ras team, in support of the group Mujeres Unidas in Tegucigalpa’s Campo Cielo neighborhood, created the community theater called “Realities of the Poor”, where the participants showed their daily experiences in a fun and very real way. The Campo Cielo neighborhood is located far from downtown Tegucigalpa and, like many other parts of Honduras, is an area affected by generalized crime and violence. The trainings lasted five months and were given by GOJoven Honduras once a week. The participants were selected based on their commitment and lea dership in their community. 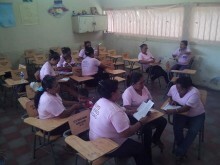 During the five months of training, the women participated in workshops on human rights, violence prevention and sexual and reproductive health led by GOJoven Honduras’ Executive Director, Gabriela Flores, the organization’s assistants Jinna Rosales and Antonio Barahona and three volunteers. The theatrical components were taught by GOJoven International graduate, Luis Joel Rivera. The group of women wrote their own scripts and acted out seven short plays addressing prevention of domestic and sexual violence, drug addiction, pollution, unsafe living conditions, conflict resolution and crime. When the workshops were over, the plays were performed on two different occasions at the Rafael Antonio Barahona School in the Campo Cielo neighborhood, with over 500 community members in attendance. The participants’ interest and enthusiasm for the trainings and for performing their plays made the sessions an enriching experience for GOJoven Honduras. During the trainings many of the women’s testimonies struck a chord with the GOJoven Hondur as team. “It was a whole new experience. To see these women’s spirit taught me about their perseverance and drive. This is something I’ll carry with me and will make me love my work even more”, said Jinna Rosales. This project was funded by Creative Associates International in the framework of a series of actions to prevent violence in Honduras. To keep up to date on GOJoven Honduras’ activities, visit us on Facebook at https://www.facebook.com/redgojovenhonduras and at gojoven.org/español/gojoven-honduras.